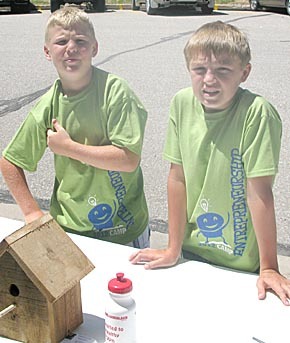 A total of 20 middle school youth from Boone County schools participated in the third annual youth Entrepreneurship Camp, June 18-21, in Albion. Each day was filled with education, speakers, trips to other Boone County communities, and business development time. Each student developed their own business individually or partnered with other students. The students developed flyers to advertise their product fair that was held on Thursday, June 21. They also created a logo and developed business cards. Students learned about business planning, legal structure, marketing, pricing and financials. Each day at camp marked the completion of a unit of the ESI curriculum, with a final graduation celebration on Thursday after the product fair.